Reginald's Tower is a circular 13th century, four storey, Anglo-Norman keep. 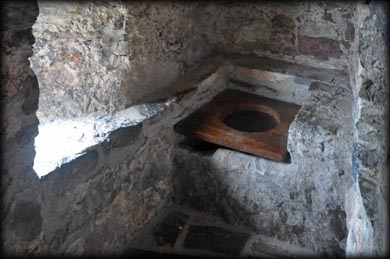 It was built on the site of an earlier fortification and was previously known as Dundory Tower. Dundory is derived from the Irish language meaning 'Fort of the Oak'. The tower stands 15.5 metres high to the parapet. The top two storeys were either built or rebuilt in the 16th century. 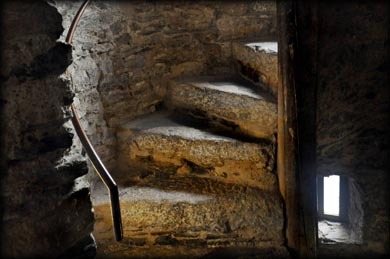 Built within the four metres thick walls is a spiral staircase, leading to the upper floors. The original doorway was on the west side, at first floor level. 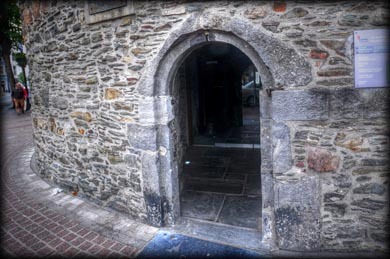 The present entrance on the ground floor was inserted at a later date, it gave access to a 16th century blockhouse, an extra fortification on the waterfront. At various times throughout it history the tower has been used as a mint, a prison and a munitions store. It is now a National Monument and houses an exhibition of Viking Waterford. On the first floor are four window embrasures, a fireplace and the garderobe, pictured below right, it is built into the northside of the walls. There is a mural chamber on the second floor, another four windows and a 16th century fireplace. There are various medieval artifacts on display as well as information boards. 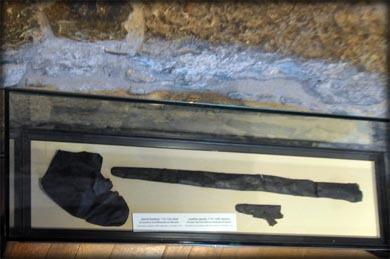 Pictured below are some leather goods from the 11th and 12th centuries. Please ask the guides to show you some of the treasures hidden away in drawers. Amongst them are pieces from a medieval board game. There is an audio visual presentation on the top floor. Situated: Reginald's Tower is located on the Quay opposite the Towers Hotel. If coming from the northside of the city follow the directions for Dunmore East. Discovery Map 75: S 6108 1245. Last visit Sept 2017.